1- Major issues with auto login fixed. 2- Automatic reconnection improved so you never loose site of your loved ones. 3- Feedback Statistics APIs added to improve the usability points. Alert, track and notify loved ones in an emergency situation. 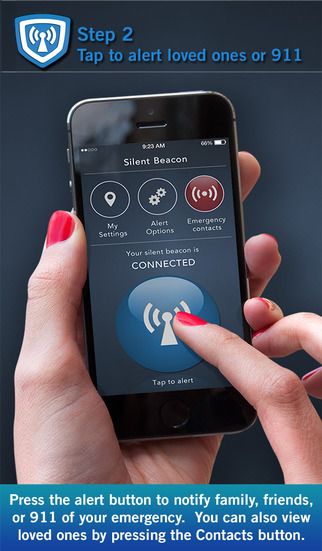 Silent Beacon provides you with the peace of mind that comes from knowing that you and your loved ones are able to instantly connect. •	Track your location in real-time. •	Send distress messages (via text, email, or app notification) your GPS location, or make a phone call with the touch of a button. •	Add multiple emergency contacts. •	Create custom messages and contact your loved ones directly. •	Send mass text messages and push notifications to your custom contact list – including 911. •	Save time: there’s no passcodes or numbers to dial. •	Get help faster, thanks to the GPS-enabled locator. •	Never get lost by using our“directions” feature. •	Keep loved ones informed of your whereabouts if you feel uneasy with our “nudge” feature. •	Locate loved ones faster when time is of the essence.